Problem, meet solution. This Ubiquiti Unifi outdoor access point can blanket an area 600’x600′ in fast Wi-Fi and survive the elements while doing it. 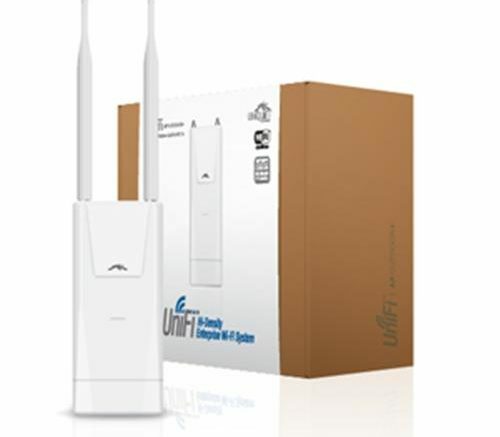 It’s just another of Ubiquiti’s easy-to-use products for providing strong Wi-Fi where before you had only static. The UAP-Outdoor-Plus gives a strong signal by connecting to your wired network. Mount it outside with a clear view of the area you want to cover and launch Ubiquiti’s configuration software to create a secure Wi-Fi network that will keep your guests happy outside! Just like with other access points, you can also create a guest network that is completely open (no password required) but is securely walled off from the rest of your network so you can get everyone connected without worrying about your personal files. I have to say that I was personally amazed by the range of this product. Placed properly you’re really going to get passable Wi-Fi for up to a quarter mile if that’s what you want. It’s perfect for those people who work outside all day and still need to be in constant contact, especially for areas where there is no cell service. Run category cable to the middle of the area you want to cover and you’ll get an area four football fields long full of wireless coverage. Yes, really that much. In fact without trees or other obstructions you could even get more. If you’re looking for a product like this to help with outdoor entertaining, you’ll appreciate the strong broadcast power. Roll a TV right out into the yard and connect a streaming stick… movie parties now take on a whole new dimension. It’s like having a drive-in in your backyard. If Wireless-N isn’t enough for you, shop our entire selection including the new UAP Outdoor AC access point that brings the absolute latest and greatest internet service out to you with a strong clear signal. All these outdoor products are designed to be as weather-resistant as possible too so there’s no reason to worry just because a little rain comes your way. Yes, this is a pretty cool world we live in… and your friends at Solid Signal just want to make it cooler.